Songs I like- by artists I don’t- the other day I heard a song [ which I will feature soon} that I really like but it was by an artist that I really have no use for. I’ve always thought that its possible that any artist no matter how bad- may have it in them to put out at least one gem. You just never know. If an artist I don’t care for comes up with something I like- I am willing to admit to it. I saw Huey Lewis and The News once in concert- somewhere around 1990- the girl I was dating at the time wanted to go- it wasn’t a bad concert- it wasn’t a great one either- another girlfriend a few years earlier had me going to see Whitesnake now that was pretty bad. In the past I have referred to Huey Lewis and The News as being pedestrian – I can’t say I dislike Huey and The News- they are just there- inoffensive. But I did like from the first time I heard it the second single off of this famously huge selling Sports album from 1983- I Want A New Drug. The single went to #6 on the Billboard chart. There were 5 Top 20 hits off of Sports- and 4 of those made the Top 10. Huey wrote the song in just a couple minutes and says it is a love song- that it isn’t pro or anti-drugs. It is a catch song and the greatest song Huey ever did in my opinion. Huey would sue Ray Parker Jr for stealing the melody from I Want A New Drug- for the Ghostbusters theme- they settled out of court. Weird Al parodied I Want A New Drug- with I Want A New Duck. 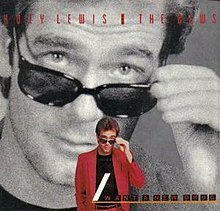 I Want A New Drug- a song where Huey Lewis got off of the sidewalk. Great category… I neither liked them nor hated them… like you said they were just there like a picture on a wall you don’t notice. I never understood the wide appeal of them..the term “corporate rock” comes to mind. I think their music is kind of non-offensive- middle of the road- non-challenging- sometimes i fair to realize a lot of people- aren’t like us- just give them something to listen to that fits in with most of the other stuff on the radio… huey seemed like a likeable fella- that probably didn’t hurt- kind of like an ‘everyman’ of rock n roll..
Mr. Mister is very similar. I call it ‘beige rock’. It’s all catchy but, nothing in particular would move you to tears. I always remembered, for some reason, that scene in Duets when he sings “Cruising” with Gwyneth Paltrow. I’m not sure if she was actually singing (maybe she was!) but that duet stayed in my mind. And it’s almost 20 years ago already. Eesh. Hmm I don’t recall seeing that- maybe its best I haven’t!